The first real basic problem I ran into was how to program the Rainbowduino as there’s no USB connector and I don’t have an UART interface. But well, nothing simpler than that: Just connect your Arduino’s Tx,Rx,GND,Reset and Vcc ports with those of the Rainbowduino, choose the right controller type in your IDE and program it as usual – works perfect for me! Check out my Rainbowduino Editor mtXcontrol here – it’s an easy way to draw shapes on your rainbowduino! Make sure you’ve selected the switch right. It has to point to the same side as the green Terminal connectors are. If you power rainbowduino through the white JST jack, flip it! Hello. Thanks a lot for this nice article. 1. On the Arduino (use to pass serial communication through), did you remove the ATm328 circuit ? I see on the picture that the circuit is on the board. 2. Concerning the connection between Arduino et Rainbow : It’s not necessary to cross RX and TX connection between Arduino and Rainbow ? hey guys, can anybody help with this, I’m almost about to give up, tried so many things and I still can’t get my arduino to talk via I2C with my Rainbowduino/8x8matrixLED. 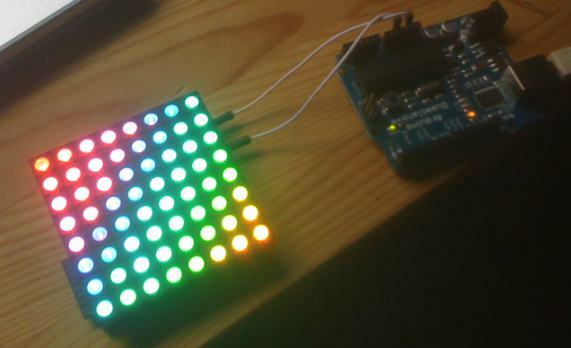 to my arduino uno, it doesn’t seem to communicate with the rainbowduino w/ 8x8LED matrix; no lights at all =(. anyone have an example program for scrolling text? because I do not understand using rainbowduino to display the letters in an 8×8 RGB LED matrix. Has anyone gotten this to work with v3.0 Rainbowduino hardware? I can successfully flash the Rainbowduino, Mtxcontrol finds the board ok and I see the rx/tx lights light up when I send activity to the board, but the lights do not light up. The only thing I can get working with this 3.0 board is the included examples that come with the stock 3.0 firmware. Ideas? I am using the latest files from, the firmware is dated 8/2/2011 from the githup site zip file “latest_mtxcontro_and_firmware_windows”, Seeeduino 328, and Windows XP. 2. Upload the “Rainbow_Plasma.pde” into the Rainboeduino and watch it perform in Standalone mode. 3. Blank out the “Rainbow_Plasma” from the Rainbowduino and watch the display turn off. 4. Upload the firmware the “mtxfirmware.pde” into the Rainbowduino and watch it all go white. The problem is it seems that the”mtXcontrol.exe” does not seem to work. There is a message at the top of the window that says “No output device found, running in standalone mode”. I do not know what that means and how to correct it. Please help!!!! I managed to get my Rainbowduino (328) programmed via a seedunio (328). I experienced the same error stk500_paged_write() ….. when following the instruction the way I achived this was todo the reset for the boot loader manually. 3. Setup arudino IDE read with the firmware.pde and 328 board format. 4. Press reset on the Rainbowduino and then quickly press the upload button (I think it needs to be under 0.5 seconds). This should then download the new firmware to the Rainbowduino board. If the Arduino and the Rainbowduino are both 328 you cannot program through the Arduino, you will need a usb – uart rs232 board i think. Any luck with your problem? I’m experiencing a similar issue, although I’m unable to even program the blank sketch. I have the newer Rainbowduino, but cannot program it through my existing Arduino 328. I have been able to program it with the Uarb_SB, but only have one available usb hub and have to keep swapping between programming the master and the rainbowduino. tried both setting 128 and 328 in the arduino IDE, any ideas? now it works! and error from my side… sorry! e. Using the Arduino IDE, load the firmware.pde sketch and then transfer it. 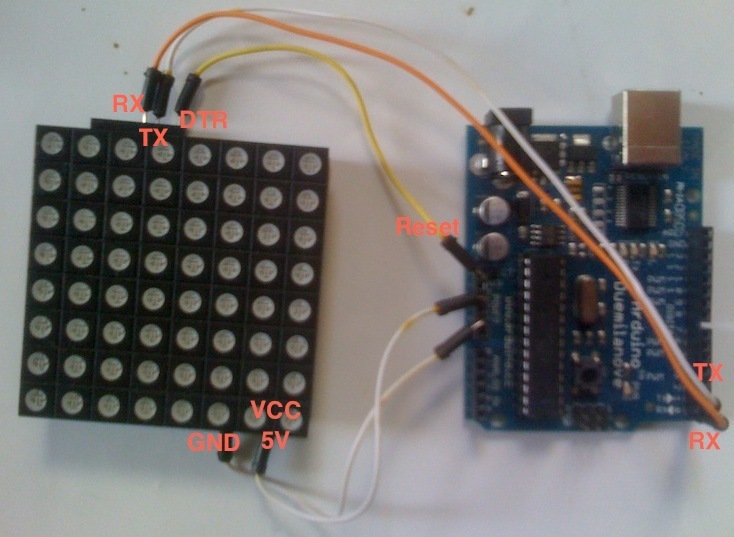 Rainbowduino… a virus in my Arduino!